Updated Tuesday March 20, 2018 by Jan Livingston. We are now taking apparel orders!!! 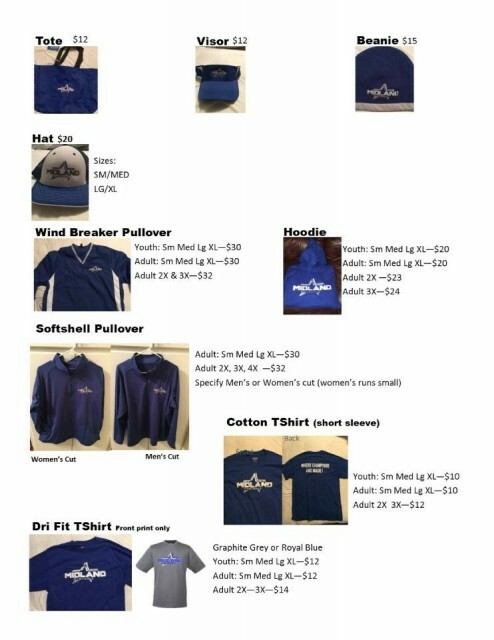 If you would like to order your Midland Merchandise, please email us at MidlandDYBBaseball@yahoo.com with the item, size, and the name the order goes under. ***NOTE: We are offering a soft shell pullover the sizes are adult only, S-4X, there is a men’s and a women’s cut. They run small. If you want to try the sizes stop by the canteen to see examples. We will close out orders March 30th. Payment is due when order is delivered. Thank you! !